Impress your family or friends with this easy-to-make sweet treat. The melted runny fillings of these sweet potato glutinous rice balls (dumplings / tangyuan) will amaze them. 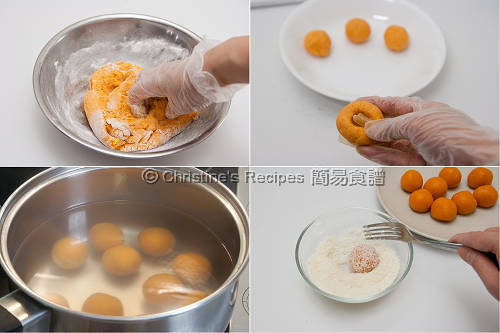 This Chinese dessert, sweet potato glutinous rice balls, reminds me of the western molten cake (aka lava cake), that often make people utter “ooz” and “aah” after cutting or biting open the tiny cute ball. Not only does this sweet treat taste heavenly, but also it has an appealing presentation with its melted filling running down. You can impress your family and friends with this easy-to-make dessert for any occasion. Palm sugar, available at Asian grocers. Steam the sweet potato over medium-high heat in a wok, until it's softened. If it’s easily poked through with a chopstick or skewer, it’s cooked through. Cut into two halves. Spoon out the sweet potato flesh and place in a large bowl. Let it cool until warm. Mix in the glutinous rice flour and knead into a dough. If it’s too dry, add water bit by bit. If it’s too wet, add a bit of glutinous rice flour. Cut the dough into 10 to 12 equal portions. Wrap a small cube of palm sugar with each dough portion. Knead into a small ball. Repeat this step with the remaining dough. Bring a large pot of water to a boil. Carefully place the balls into the pot. (Note: If your pot is not big enough, cook in two batches.) Immediately stir the water, make sure each ball doesn’t stick to the bottom. Cook over medium-high heat, until the balls float onto the surface of water. Reduce heat and simmer for another 5 to 10 minutes. Drain out the balls onto a lightly greased plate. Make sure they are not stacked together. Roll each ball with desiccated coconut and coat evenly. Enjoy! As every sweet potato contains different amount of water, add some water if the dough is too dry, or vice versa, add some flour if it’s too wet. No matter whether you add water or flour, it has to be added by a small amount at a time. 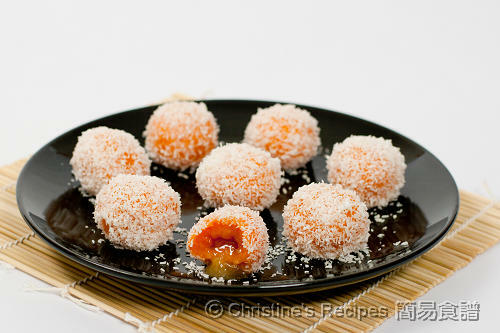 The leftover glutinous rice balls can be kept in an air-tight container in fridge for up to a few days. When needed, remove from the fridge and place in room temperature for about an hour, the balls would return soft. To shorten the cooking time of sweet potato: Peel and cut the sweet potato into small cubes before steaming. Smash the flesh with a large spoon, a potato masher or potato ricer. Oh I love these from young, our mum would make these for us because sweet potatoes are so readily available. Of there is also the pandan flavored type which is also very delicious! :) u might also wAnt to wrap those sweet potatoes in clingwrap n microwave them for a minute. It comes out cooked through, soft n easy to spoon out the flesh! Made a similar thing with pumpkin and malt syrup a while ago...I like sweet potato even more. Looks tasty, love the way they are so shiny. Thanks for sharing. love this asian version of molten/lava goodness. beautiful! this is just like our odeh odeh. This is something like our onde onde, except that it's not sweet potato but glutinous rice flour, also with palm sugar filling. Can't help admiring your clicks! ooo ahhh, I love the oozy filling! We have prepared these balls this afternoon and were delicious. Thank you for the recipe! These look so good I am going to buy some glutinous rice flour next time I am at the Asian store! Looks yummy, I'll be making them soon, can you freeze them?? It's better to finish it as soon as possible. Not quite suitable for freezing, yet chilling is ok.
Do you have to eat these warm? Does the centre harden after it cools down? Great recipe! ^^ I have a question tho, I'd like eat it cool, would the palm sugar solidify if it gets cold? These glutinous rice balls are best served at room temperature with sugar in liquid form inside. i just realized that i did not cook well inside. is it possible to reboil it after it has been put in the refrigerator? You might re-cook it again, or just steam it until cooked through. Do you think this is suitable for peanuts or some other filling besides sugar? is there any trick to keep the sugar from oozing out? If the glutinous rice balls are still hot, the sugar inside will ooz out. what other alternatives are there instead of palm sugar? I want to try putting something that i already have at home. can't wait to try it! These look amazing! I'm so eager to try making them. The recipe says that you can refrigerate them for a couple days? Will the sugar inside become molten again if they are just allowed to sit at room temperature? Thank you! I don't know where to get cubes of palm sugar. Is there a substitute? You can get palm sugar from Asian stores. 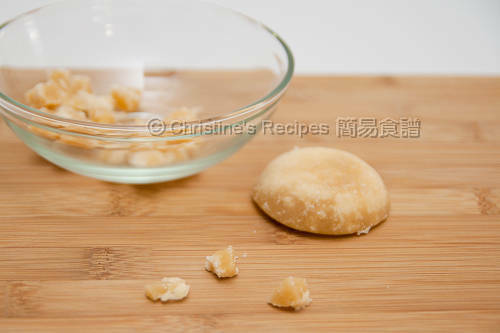 Or replace with slab sugar 片糖. First visit to your blog. I love it! i believe these are called onde onde's and they are so beautiful. can i know glutinous rice flour and glutinous flour have any different? You can skip palm sugar if you don't have any. Hi, can i make the ondeh ondeh without coconut then freeze it and cook when i want it then coat it with coconut when it's done? You can freeze them if you like. It's better to return them to room temperature before cooking, coating and serving. I just tried this recipe and it was great! I was worried it would be too sweet so made some with slab sugar and some without. Turns out, it tastes MUCH better with the sugar and I normally don't even like anything to sweet. Thx so much! :) Happy holidays! Glad that you liked this dessert. The sugar inside makes the glutinous rice balls taste much better. It won't be too sweet because the dumplings are boiled in water. 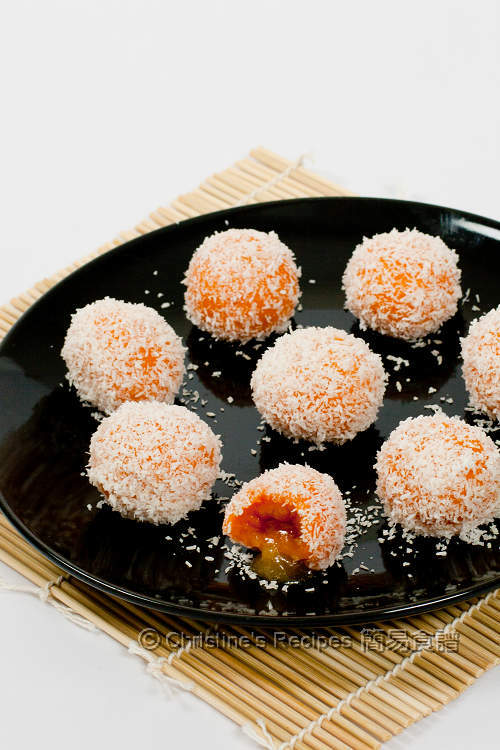 Thank you Christine for sharing your sweet potato glutinous ball recipe. I used to make these but when I reheated the leftover the next day, the balls collapsed. After reading the notes in this recipe, I realised my mistake, i.e. leftover balls from the fridge just leave them to soften at room temperature before consuming. I shall make again soon using your recipe.